Wooden Dummy training doesn't have to be reserved for mid-to high level instructors. 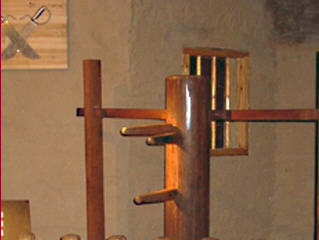 After all, the wooden dummy is a training tool - and who needs training more than the newer students of Wing Tsun? That does not mean that we will start your training off showing you the complete wooden dummy form and related chi sau sections and applications. That would be like sending an elementary school third grader to attend a calculus lecture in College. However, the Wing Tsun Wooden Dummy is a fantastic training tool that is perfectly suited for beginning students to practice their own exercises. Even (or rather, especially) at that early level, the dummy teaches better posture, improved body positioning and angling, forward energy, basic footwork, chain punching, chain-kicking, leg sweeping, distancing, and a whole lot of other useful things. So, here at Backyard Wing Tsun, wooden dummy training is not some mythical activity that's shrouded in phony secrecy, it is part of your daily training reality, almost from day one. ... that is the Way of Wing Tsun!